If you follow me on Instagram, you may have seen some of these crochet succulents popping up on my feed the last few weeks. I’ve been working on these for a big project which I will reveal to you all at some point in the next few weeks, but for now I wanted to publish the pattern. 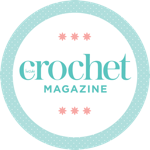 When I decided I wanted to crochet succulents for my big project, I looked in all the usual places online – Pinterest, Google Image search, Ravelry, but I couldn’t find one single pattern I liked. I had to take things into my own hands. I’m delighted with how these have turned out and I can’t stop making them. I hope you enjoy the pattern – I’d love to see how you get on with it. Double Crochet (dc) – insert hook, pull up a loop (2 loops on hook); yarn over, pull through both loops on the hook. Treble Crochet (tc) – yarn over, insert hook, pull up a loop (3 loops on hook); yarn over, pull through two loops; yarn over, pull through remaining two loops. Slip Stitch (ss) – insert hook, pull up a loop, pull straight through loop on the hook. Chain (ch) – yarn over, pull through loop on hook. Make a magic circle as below – your working yarn should be facing you, with the tail behind. Pull up a loop and ch1 in the magic circle. To start working into your magic circle, insert the hook from front to back and pull up a loop, then yarn over and chain one. Make 12 dc into a magic circle. Once you’ve worked your 12 stitches into the magic circle, it should look something like this. Pull tight using the tail. Once you’ve pulled the tail, the stitches should come together like this. Ss into the front loop of first dc. This round will be worked into the FRONT LOOPS ONLY of the stitches from Round 1. The front loops might be a bit of a wiggle to get into from round 1 – bear with it! *Skip next dc of round 1. (3tc, ch2, ss in 2nd ch from hook to form picot (see below for picot tutorial), 3tc) in next st.
To form your picot, insert the hook from back to front and make a slip stitch. Repeat from * to ** twice, omitting last ss. Ss into closing ss from Round 1. Where to put the closing slip stitch of your leaf rounds – always head for the closing slip stitch of the previous round. The back of the work should look like this – see the unworked back loops of your round one stitches? This round we will be working into the unworked back loops of round 1. Pull up a loop in any of the back loops and ch3. Insert your hook into one of the back loops. Make sure you pull up your loops as shown here – the right side of the work should be facing you as you make the stitches. I’m set up for the treble here – see how I will work it over the tail? This will help secure your yarn. Work 2tc in each remaining back loop of the round prix du viagra. Note that the back loop of the first stitch of round might be tough to locate – you’ll work it out. COUNT YOUR STITCHES – you should have 24 at the end of this round. Join round with a slip stitch in the front loop only of the third chain of starting ch3. You’ll recognise round 4 – its exactly the same as round 2, but with a few more repeats. *Working into FRONT LOOPS ONLY, (3tc, ch2, ss into 2nd ch from hook to form picot, 3tc) in next stitch. Close as in round 2 – by making a ss in the closing ss of previous round. This is how your work should look from the front after round 4 – pretty! This is how your back should look – don’t those unworked back loops look easier this time around? This round is similar to round 3, but with different increases. We’ll revisit increases at the end of the pattern when we discuss how to grow your succulent. Pull up a loop in the same way as round 3 – but this time, make sure you pull it up in a back loop where the front loop has the centre of a leaf in it from round 4 – ch3. Make 1tc in the same stitch as your ch3, as before. Close round by making a ss in the front loop of the 3rd ch of opening ch3. Hint when working this round: when you get to the back loop of the opening ch3 of round 3, it might prove difficult to locate. If it helps, count your stitches – you should have three back loops to each leaf – one in the centre, one on either side – and one back loop between each leaf. You will find that the back loops seem to “disappear” at the ch3 – as long as you make sure you adhere to the count (3 back loops a leaf, one in between), you should be able to stay on track – pick up the back loop of the chain which will be just before the next obvious back loop. This is where the back loop of the opening chain will be found on your work. Round 6 is going to feel familiar – it’s the same as round 2 and round 4, but again with more repeats. Weave in all your ends with your wool needle and admire your work! I’ve taken you up to the third layer of leaves, but there’s no reason you have to finish there. You can keep growing your succulent by changing your increase round. In our first increase round, we increased in every stitch by making 2tc. In our second increase round, we still increased 6 times, but as we were starting with 12 stitches, we added a plain stitch in between increase, meaning we worked 2tc, 1tc repeats. To continue to increase, just make sure that you add one more 1tc stitch in between each 2tc increase – for example, our next increase round would be 2tc, 1tc, 1tc repeats. Here’s one I made earlier with an extra set of leaves. If you work your increase rounds in this way, you will always have the right number of stitches to work your leaf rounds. I hope you’ve enjoyed this pattern – I’d love to see any succulents you make using it! They are really sweet, and so clever of you to create your own pattern. Elsie, these are so sweet – I can see how it would be hard to stop making them. And they’d look great in a variety of colors, too. Thanks for the tutorial! Thank you so much for creating this pattern and tutorial. The little succulents look beautiful! I love a tutorial with millions of pictures. I know how much work it is but so much appreciated at this end! Thank you so much for sharing your pattern. I’m going to get busy!!! So beautiful and I love the color. Can’t wait to see what you’re doing with this.